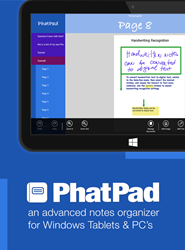 PhatWare Corporation announces today the immediate availability of the PhatPad 2.2 note-taking and collaboration Metro-style app now optimized for Microsoft Windows 8.1. The new version of PhatPad not only leverages the new Windows Metro interface, but also offers even better handwriting recognition quality and a range of advanced features optimized for the Microsoft Surface tablet and other Windows-based computers. For more, please visit PhatWare's web site at http://www.phatware.com/phatpad. More than just a note-taking app, PhatPad turns a Microsoft Surface or any other Windows-based tablet or a desktop computer into an advanced brainstorming tool by enabling users to draw, write, and type on the iPad, then instantly share ideas via email, Dropbox, Microsoft SkyDrive, Box, Google Docs, or in PhatPad's presentation mode. PhatPad is highly regarded for its smooth-flowing digital ink technology, which lets tablet users scribble notes as if they are writing on real paper, but is best known for its powerful multilingual handwriting recognition engine automatically converting handwritten notes into text. PhatPad is available in eleven languages, including English, German, French, Dutch, Danish, Norwegian, Finnish, Italian, Portuguese, Swedish, and Spanish. Brainstorming and collaborating with team members is simple using PhatPad's Presentation mode, which allows users to create quick presentations and display them on the computer screen and external monitor. While in Presentation mode, users can record and play unattended presentations by synchronizing document pages with their recorded voice. PhatPad is available on Windows 8.1/RT Tablets and Desktop Computers, as well as iPads and Android Tablets and is distributed via the Windows Store, iTunes App Store, and Google Play. PhatPad is priced at $ 4.99 on each supported platform. Founded in October 1997, PhatWare Corporation is a leading provider of easy to use powerful software products and professional services for the mobile and desktop computing marketplace. PhatWare specializes in handwriting recognition, digital ink, note taking and database, and network management software development. PhatWare's products include such popular titles as PenOffice®, PhatPad®, WritePad®, and others. PhatWare Corporation is a Microsoft Certified Partner, and Intel Software Partner. To learn more about PhatWare, visit http://www.phatware.com. © PhatWare Corp. 2013. All Rights Reserved. PhatWare and WritePad are registered trademarks of PhatWare Corp. in the USA and/or other countries. iPad is registered trademarks of Apple Inc. Android and Google Play are registered trademarks of Google Inc. Windows Store, Windows, and Microsoft SkyDrive are registered trademarks and copyrights of Microsoft.